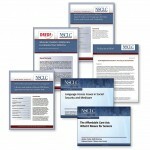 NSCLC publishes frequent issue briefs, reports and advocate’s guides that help on-the-ground advocates assist low-income older adults and persons with disabilities deal with often complex challenges related to federal and state benefits programs. Current and past reports are listed here and are all available online. Many of the reports are also reflected in our ongoing, free webinar series. To ensure that you receive updates on the latest reports or webinars, sign up for our health or income network alerts.